RAWALPINDI, April 13 - India captain Saurav Ganguly won the toss and put Pakistan in to bat on a green top wicket in the deciding third and final test on Tuesday. There is plenty of grass on the wicket that is expected to help seamers early on. Ganguly returned to the Indian team after missing the first two tests due to a back injury sustained in last month's fifth one-day international. It is still unclear who would open the Indian innings, with Ganguly hinting he may do the job "for this one time". 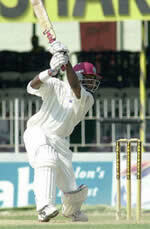 ST JOHN'S, Antigua, April 12 - West Indies captain Brian Lara created history when he became the first man to score 400 in a test innings on the third afternoon of the fourth and final match against England on Monday. India and Pakistan face off in a historic series. India's first tour in 13 years brings the two exciting Asian teams in what promises to be a closely fought high pressure series. Speeding bullet or Solid rock? Shoaib, the world's fastest bowler, has been in electrifying form over the last two years... He has certainly been the most devastating.